The Institute for Supply Management gauge of manufacturing conditions for the just completed month of October supports the notion that the grind forward economic trend remains in place. Most encouraging is the new order data (highlighted line in the table below). The increase in this subcomponent is a good “leading indicator”. The highlighted footnote below the table is a reminder of the ISM’s suggested interpretation of the release. An overall index above 51 and a new order index also above 50, suggest the grind forward will continue even in the face of the “fiscal cliff” induced inertia that so many are talking about. Nov. 1 (Bloomberg) — Following is a summary of U.S. manufacturing conditions from the Institute for Supply Management. The Bloomberg median estimate from 88 economists was 51. ’12 ’12 ’12 ’12 ’12 ’12 ’12 ’12 Avg. 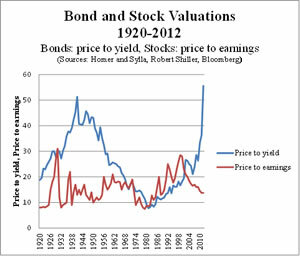 Meanwhile bonds and stocks remain priced for economic stagnation—or worse (click the chart to the right for a larger view). With such low expectations, even a continuation of the grind forward economy burdened by Washington’s wet blanket policies, will likely allow stocks to deliver decent returns. 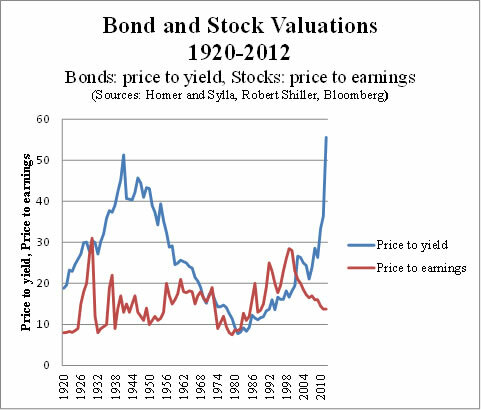 Bonds? That’s a whole different prospective return story all together!